Engineering reports, Tendering documents, presentations, correspondence, etc. A number of U.S. states and Ontario have developed Fix-It-First policies. The approach provides assistance and incentives for the repair and maintenence of public buildings, including schools, rather than demolition. The site contains a great handbook for saving schools, including how to deal with over-inflated renovation estimates and school administrators who have no experience with the repair of older buildings. “As America rediscovers the value of walkable communities, recommended guidelines for the location and design of schools are changing,” the Pennsylvania Board of Education has concluded. The Board now promotes the renovation and restoration of older neighbourhood schools as a green alternative that is important to the vitality of communities. In the Board’s report Renovate or Replace? The Case for Restoring and Resusing Older School Buildings, government leaders, education experts, designers, planners, environmental experts and health advocates put out a strong call to re-engineer our thinking on the value of older buildings and neighbourhood schools. Like many other American school districts, Pennsylvania education planners have discovered that old theories of economy of scale don’t deliver quality education in a cost-efficient manner. Although the schools profiled are generally of a larger scale than Saskatchewan schools, the ideas and examples are an excellent resource for anyone interested in the environmental and social value of neighbourhood schools. If only our own school boards were this forward-thinking! Ontario has come up with a province-wide school renewal plan that puts students and communities first. The plan – called Good Places to Learn: Renewing Ontario’s Schools – advocates a major investment in repairing and maintaining schools, rather than closing them. In 2003 the Education Ministry asked school boards to place a moratorium on closures and conduct reviews of their facility needs. The review found that schools were in poor repair, that funding formulae favoured closures instead of repairs, and that capital costs and needs were driving school closures instead of the best interests of students. If you think this sounds like the current situation in Saskatchewan, you are right. The difference is, the Ontario government responded to facility needs not by accelerating school closures, but by setting out a plan and dollars to invest in school renovation and retrofitting. The province anticipates some 4,500 jobs will be generated as a result. As well, the renewal plan views excess space from declining enrolment as an opportunity, not a weakness. Empty spaces will be used to move to smaller classes in lower grades, and to introduce on-site early learning and childcare programs. A video about what historic schools can teach our children. Are Canada’s Historic Schools Our Next Endangered Species? Canada’s older schools provide not only a place of learning for our children, they are important anchors that help define and sustain our neighbourhoods. Schools are among the most important structures in our communities, often built to a level of detail and craftsmanship rarely found in other buildings. Hard Lessons: Causes and Consequences of Michigan’s School Construction Boom. This article provides a detailed review of how school construction decisions — whether to renovate existing buildings or build new, greenfield facilities — are made in Michigan and their effect on development patterns. The report aims to help school officials, community leaders, homeowners, and parents evaluate the full cost of new school construction or renovation. It recommends changes in state policy that, if implemented, will capture the economic and cultural benefits of renovating older schools or building new ones in town. 20p. 2009 – RealRenewal welcomes the development of the North Central Shared Facility. We do not and have never had a position on the future of Scott Collegiate – which will share space with the proposed facility – because we do not consider it a school closure. We note, however, that many members of the North Central community and wider public have contacted RealRenewal with concerns about the impending demolition of the current collegiate. We reviewed the notes from the community consultation meetings and saw that indeed there were voices at every table calling for recognition of Scott’s value to area residents as a heritage property. Our advice to the School Board and facility partners has been to hear these sentiments with full respect and consideration, as they arose during the course of a community consultation. We have also advised the provincial government to revise its capital funding policy so that the idea of renovation can at least be on the table as a workable possibility. Officials in the Heritage Branch and Education Ministry have begun meeting to examine how this might be accomplished. 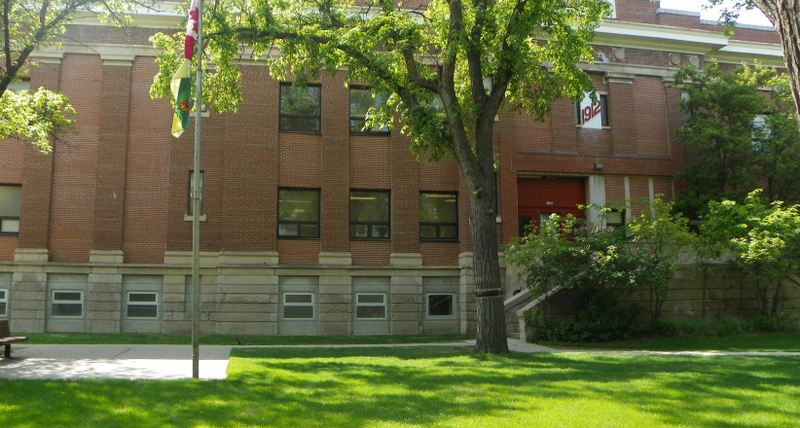 The Regina Board of Education argues that older buildings cannot be rehabilitated because the RBE is committed to introducing open classrooms across the system, a concept that is the centre-piece of design work by the contracted architectural firm, U.S.-based Fielding Nair International. It’s difficult to find up-to-date information on open classrooms – most studies were conducted in the 1970s when the idea was in vogue, or have been carried out by FNI, the firm that is selling the design. School House Consulting – Open Concept Schools: Why is the Failed Experiment Making a Comeback? State University provides this brief historical summary of the open classroom movement. While open classrooms are based on progressive theories of education, the architectural arrangement became problematic in many schools. Noise concerns and distractions resulted in a widespread retreat from open classrooms within a decade, and school districts began the expensive process of reinstalling walls. Open Spaces Out of Vogue and District May Put an End to Open Classrooms are a couple of articles highlighting the problems. Lately there has been some talk of the revival of open classrooms, particularly for their potential to break overcrowded schools and classrooms into smaller units. This seems to be a key point made by RBE board members. Advocates say design options such as lower ceilings and sound-bafflling ductwork can help address noise problem, and that open classrooms can live up to their original potential by introducing a teaching style that emphasizes more activity and group work, which the architecture is better suited for. However, there is also an argument to be made for a divorce between the teaching concept and its unpopular school design. The original authors of the open classroom idea stressed that open classrooms are not a physical space; rather, they are a theoretical concept. In other words, when early theorists said ‘take down the walls of learning’ they didn’t mean literally ‘take down the walls.’ They meant options like increased interdisciplinary learning, which could take place in any setting. Yet many administrators latched onto the literal interpretation. Despite attempts to improve the system, open classrooms continue to have issues. Here are some recent observations by a teacher and a parent concerning noise control, distractions and safety concerns. Some U.S. parents have banded together to lobby against open classroom architecture. While the ideas on open learning have merit, the architectural challenges remain – particularly when school boards insist on tearing down our schools because they can`t open up load-bearing walls, as is the case in Regina. The National Trust and the National Clearing House for Educational Facilities argue that historic schools can readily accomodate open learning by making use of wide hallways and placing additions onto the buildings. Often, a main engineering issue is how to hook the old building onto the new facility. Some school districts have looked at this not as a barrier, but as an opportunity to create a breezeway or atrium bridge between old and new, thereby mitigating some of the engineering issues that go with connecting old and new walls, while at the same time providing space for an open learning environment. Environmental Health Conditions in California’s Portable Classrooms – Report by the California EPA (2004).